The winning dish was definitely the Celery Root Pot Pie. You know how the smell of freshly baked pot pie can make you stop talking mid-sentence? It makes your eyes dart trying to figure out who you've got to pounce to grab a bite, fork in hand. Yes, that is what Fat Radish's Celery Root Pot Pie evokes. Once you break through the flakey crust, a pocket of steam escapes that has a lovely hint of celery. Meat-lovers, do not be deterred. 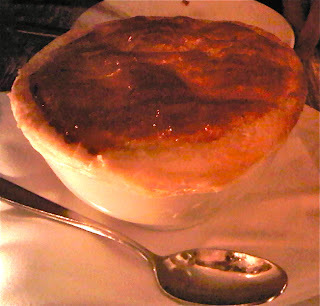 While it is an all-veggie pot pie (as far as I could tell, but confirm if you must! ), it is filling and hearty. My hubby in Neanderthal-form is the type that would be chanting "meat, meat, meat!" but he also thought it was spoon-lickin' good! Two mediocre dishes were the Vegetable Plate and the Lamb Loin. The Vegetable Plate consisted of a steamed assortment of seasonal veggies tossed with salsa verde. The focus was on the veggies which were light and fresh, but we quickly got bored and wished we could magically trade it in for a bowl of spinach and artichoke dip. Where's that Fairy Godmother when I need one? The Lamb Loin with Maitake Mushrooms, Market Spinach and Red Mustard was cooked well but was not worth the money ($24). It was the opposite of what we expected as it came with a lot of veggies and not a lot of lamb (four tiny slices). Following the steamed Vegetable Plate, it was veggie-overkill. The wine list of affordably priced and there were bottles in the $30-$50 range as well as some +$100. The cocktail list is limited; I had a Moscow Mule which was light and refreshing, but I could have used an extra pour of vodka. 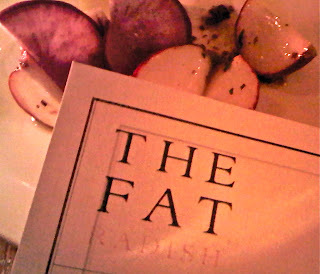 The Fat Radish is great for date night or with a group of friends. There was a constant buzz of conversation, but it wasn't so loud that you couldn't hear the people at your table. The space is cozy and unique with a hint of history; look up towards the pillars against the wall and you'll spot Chinese writing as remnants of its former days as a sausage factory. Overall I enjoyed the food and it didn't break the bank. This place seems to be vegetarian-friendly or good for those who love greens. 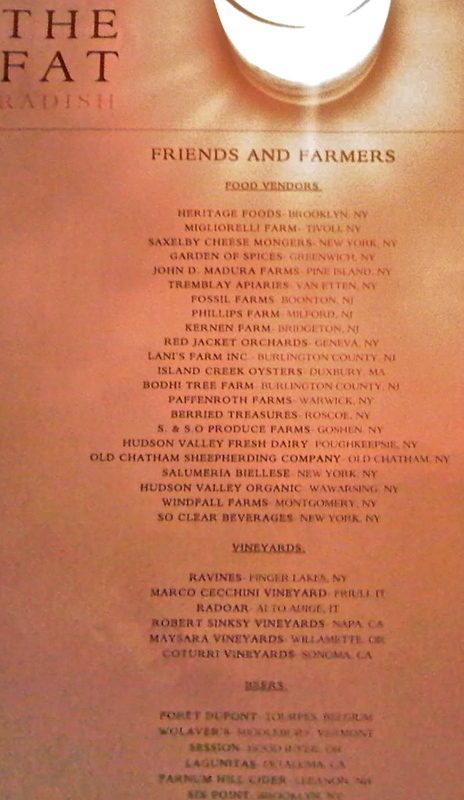 On the back of the menu they list out their "Friends and Farmers" from whom they source their ingredients, many of which are local! 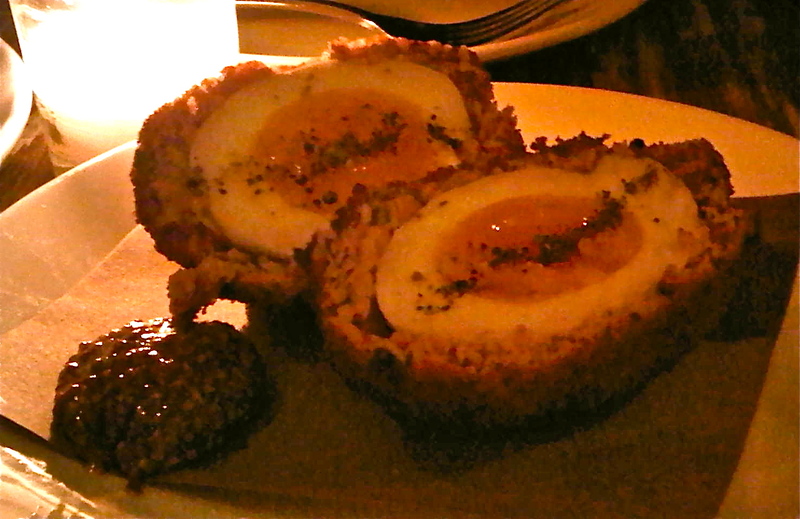 Next time I will probably stay away from the meat entrees in favor for fish or scallops. Yes, there will be a next time!